Yesterday, my brother happened to be over around dinnertime and I happened to have just made these and so I happened to offer him an ENTIRE RAMEKIN (!!!) all to himself. I am going to choose to believe that his decisions had nothing to do with the fact that these potpies had chickpeas instead of chicken. And everything to do with the fact that my mother traumatized us by feeding us frozen chicken potpies when we were little. For all the nutritional devastation that those potpies left in their wake, however. They were, in fact, delicious. The odds that my mother could have come up with a just-as-good-tasting-and-equally-easy homemade version? Slim to none. That’s where these chickpea potpies come in. The most intimidating part of making your own potpie from scratch is, arguably, the pastry crust. Your butter needs to be cold, you need to know how to use a pastry cutter, and then you need to chill it and roll it out…and if you’re me, nothing ever works out quite the way it’s supposed to and you end up eating dinner at 10pm. Which is okay (albeit non-ideal) for a 24-year-old single lady, but not so much for a family of five. I get it. What if I told you that you don’t need a pastry crust. That maybe, just maybe…a cornbread crust is the way to go? I know I’m really pushing the envelope here, but hear me out. Not only is it healthier, but it tastes delicious (sightly sweet, mostly savory. Heavenly.) and you can whip it up in exactly five minutes flat. As for the filling…I’ve made a few potpies in my life and it is harder than you’d think to get the consistency of their innards right. There’s a fine line between so-loose-you-could-drink-it-with-a-straw and so-thick-you-might-use-it-to-superglue-your-Halloween-costume-together. But as soon as I poured the veggie broth into the flour-covered pan, I knew that all would be right in the world. At least as far as dinner was concerned. And sometimes. That’s all the comfort you really need. Do you guys have a favorite comfort food recipe? 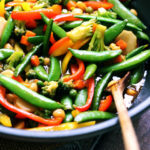 Or a favorite way to make your favorite comfort food easier to make and/or healthier? If so, go on over to kelly-confidential.com and share it or vote on the comfort food recipes that are already there! For every selection or entry, Electrolux will donate $1 to the Ovarian Cancer Research Fund as part of its $1 million commitment to the cause. Plus, visitors will be entered to win an Electrolux Induction Cooktop, which makes cooking your favorite comfort foods fast and easy. And feel free to enter my GIVEAWAY!!! Boil the potatoes and carrots until tender but not soft and set aside. For the filling, heat a large saucepan until hot. Add the oil and onions. Saute onions until they are soft, about 5 minutes. Sprinkle in the 1/4 cup flour and mix. Slowly pour in the vegetable stock whisking well with a wire whisk. Still using the whisk, cook the mixture over medium heat until thickened and bubbly, about 2 to 3 minutes. Add the chickpeas, peas, cooked potatoes and carrots, salt, pepper to taste, and Tabasco. Cook on medium heat until the mixture is heated through, about 2 to 3 minutes. turn into the prepared casserole dish, spreading evenly or divide evenly among ramekins. For the crust, in a bowl combine the cornmeal, 3/4 cup flour, baking powder, sugar, and salt. In a small bowl, combine the milk, oil and egg yolk. Add to the dry ingredients and mix until uniform but a bit lumpy. Spoon the batter evenly over the filling. Bake until the top is golden brown, about 22 to 25 minutes for the casserole and 10 to 12 minutes for the ramekins. I am submitting this to Weekend Herb Blogging, which is being hosted this week by Lynne of Cafe Lynnylu. Frozen potpies traumatized me as well as a child. My dad bought them in bulk. I know I’d love this! It sounds great! I love potpies, but with chickpeas?!? Yours look so good that I’m ready to be converted. yum, vegetarian pot pie, i love you! I like the idea of this easy crust. I avoid making pies because of the pastry. The only difference between chicken and chickpea is the last 2/3 alphabets, thats all, nothing major. I would not have said no if I was over, these sound delicious! I have that cookbook and have yet to make anything from it, need to get on top of that! 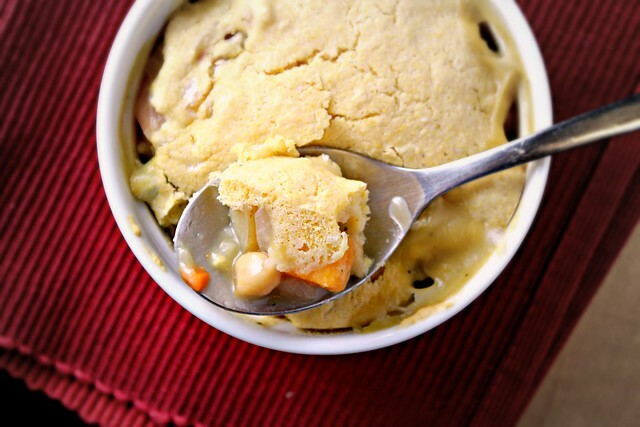 I don’t think I have ever had pot pie, but didn’t really think I was missing out… until i saw your chickpea version! Love it! I had those frozen pot pies growing up, too. The salt content, to this day, in some of the frozen foods is actually frightening. I’ve put many an item back on the shelf after seeing how loaded up on sodium it is. This pot pie here today, though, looks divine! Love that you subbed chickpeas here! I am such a fan of these swaps. I just might have to make this with a chickpea flour topping! Very interesting idea! It sounds tasty but I would probably not use the cornbread topping. And funny about how our childhood memories shape us; my mom made everything from scratch so those frozen pot pies were an absolute treat in my house back in the day! pot pie with a cornbread crust? yum! my brother is the ultimate food skeptic, too. i’ve totally made mini chicken pot pies like this, but i love the cornmeal idea. yummmm. I understand your brother. Frozen pot pies made me never want to eat pot pie ever again in my life. And I haven’t! But I think in this case your brother missed out. I like the cornmeal idea. It is more simpler than having to make the crust. Smile. We have a real aversion to pot pies too. (The frozen ones, only though!) These look so tasty. I love the cornbread crust. Thank you for sharing another of your delicious treats. I’m drooling. I hope you are having a lovely day full of laughter and love. Many blessings from Austin, my friend. I love the idea of using a cornbread topping!! I’ve never made a potpie of any kind, and you totally have my number–it’s the fear of that pastry crust. Obviously that excuse is now obsolete. Ya. So. I don’t know if it’s the loose or the thick or the runny or the gooey…I just have never ever liked pot pies. Regardless of their innards. But now you’ve got me wondering if it’s whomever has served them to me all these years, doesn’t know how to make them. More importantly, what on earth are you doing eating dinner at 10pm? Well this goes without saying, but your brother is crazy. Those look amazing! It looks great and I love the idea of using cornbread as the crust. I don’t have the easiest time of making crust. It’s been suggested to be to try it in my food processor, but let’s be realistic, cornbread is easier and tastier. BOOKMARKED! This is so being made soon. It has finally cooled down to the 60’s here but it will go back up to the 80’s in a couple of day. However, once it cools back down again, this will be on the menu! 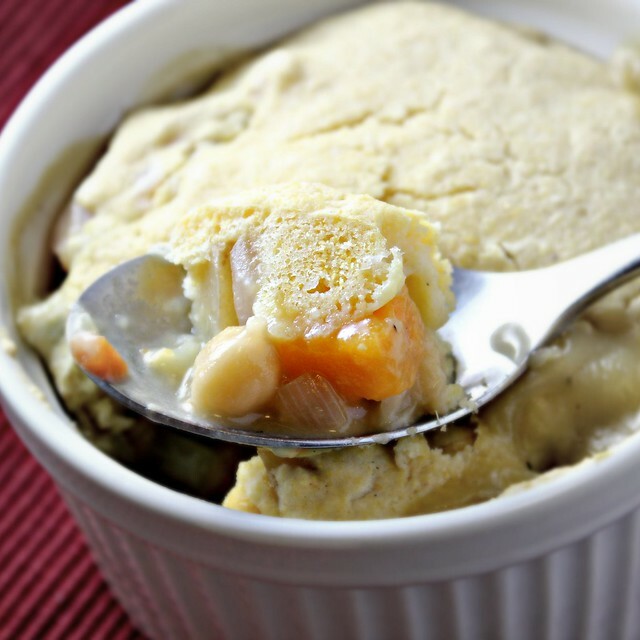 Love this potpie as i have chickpea is my favorite. I need to try this cornbread crust. sure taste awesome. Thank you for this vegetarian pot pie recipe, it looks fantastic. 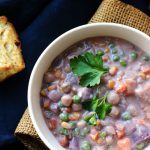 I haven’t had pot pie since I gave up eating meat, and I’m looking forward to trying this chickpea version! I love potpies and it’s always so easy to make. never added chickpea though. it looks lovely. What a genius idea. I haven’t much been into pot pies – but this I can get into. Thanks so much for sharing. I love it with the cornbread crust, great idea. And chickpeas, too, this is a winner. Love this recipe Joanne and I also remember those frozen chicken pot pies. I had them growing up years ago (they’ve been around forever!)…. What a great combination! I never would have thought to use cornbread as a topping for pot pie but it’s great one. This is definitely pot pie weather we’re having! Yum. I’m so happy pot pie season is here. Homemade Chicken Potpie is at the top of my list for comfort foods. I would have never thought to make potpies with chickpeas. That’s brilliant!!! It looks absolutely fantastic. I have NEVER been interested in pot pie, even when I ate meat. Until now.. I will have your brother’s ramekin… i won’t say no.. come on send it over… please? Delicious! The cornbread sounds wonderful. Frozen chicken pot pies are definitely one of those grossly delicious memories of my childhood 🙂 It’s totally time to upgade though! this is going on my menu plan in 2 weeks (traveling next week) and i can’t wait!! i have a minor chickpea obsession right now! The cornbread topping is def a win! It looks so light and delicious! Scrumptious pot pie! The cornbread crust sounds excellent! I can’t believe your brother passed up eating one of your beautiful and tasty pot pies – his loss, your gain. Now see, THIS is a vegetarian dish that I could devour and not even miss meat. This looks incredibly tempting, Joanne and I am not a fan of chickpeas! I’m actually considering making these. 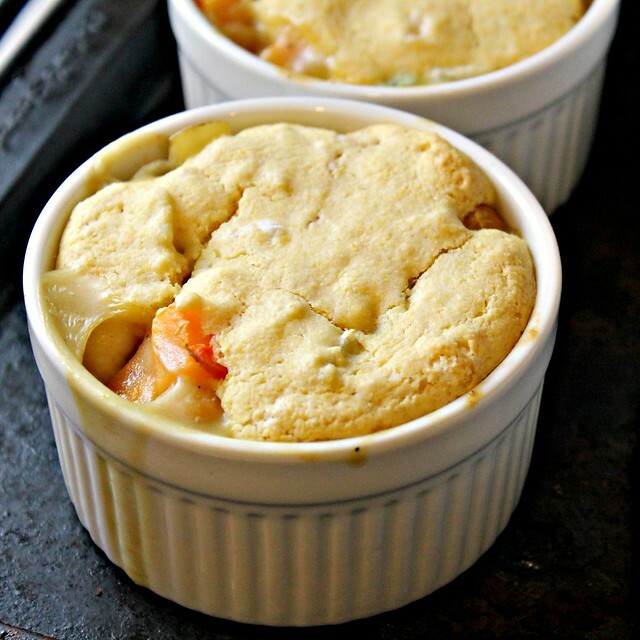 Such awesome pot pie.. veggie…. Made this for dinner tonight. Subbed homemade mushroom stock for the the chicken stock. Otherwise everything was exactly the same. My kids loved it! Which is saying a lot! It was great. Never seen cornbread crust on top of potpie, simply interesting and fantastic! now this looks like heaven! a cornbread crust makes everything better! I’m guessing, your brother had no idea what he was missing. aren’t little bros the best!! lol, loving this great potpie!! I’ll eat your brother’s share. 😉 This looks wonderful–I love the ease and comfort factor of the cornbread crust. This is genius. GENIUS! I can’t wait to make these! So cute, too! 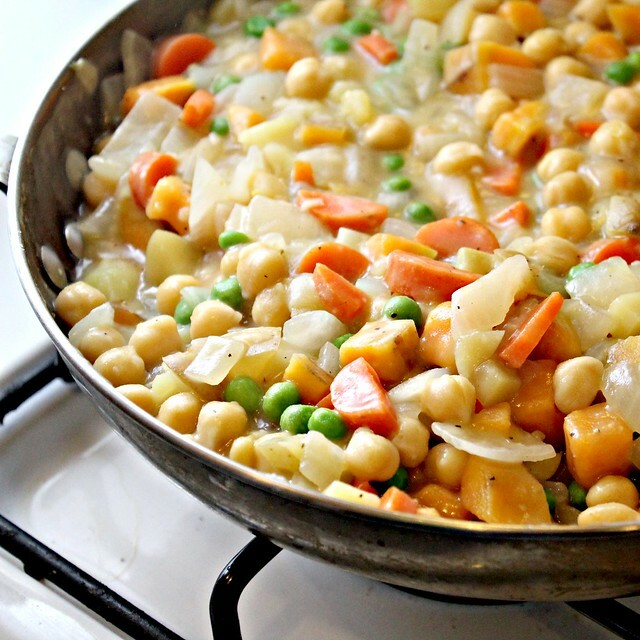 I love chickpea and this potpie looks great. Clever idea, Joanne! A cornbread crust. Love it. And will use it on other pot pies for certain. But your pot pie looks so fresh and healthy! Great photography! This is a modern version of the traditional pot pie…Its lovely. Definitely more healthy, which helps when I can eat several of them at one sitting. I can’t imagine turning down a pot pie! The cornbread crust looks fabulous, and I love the all vegetable filling. This looks so great. We are meat eaters, but I’ll absolutely try this recipe! I’ll take Daniel’s pot pie! 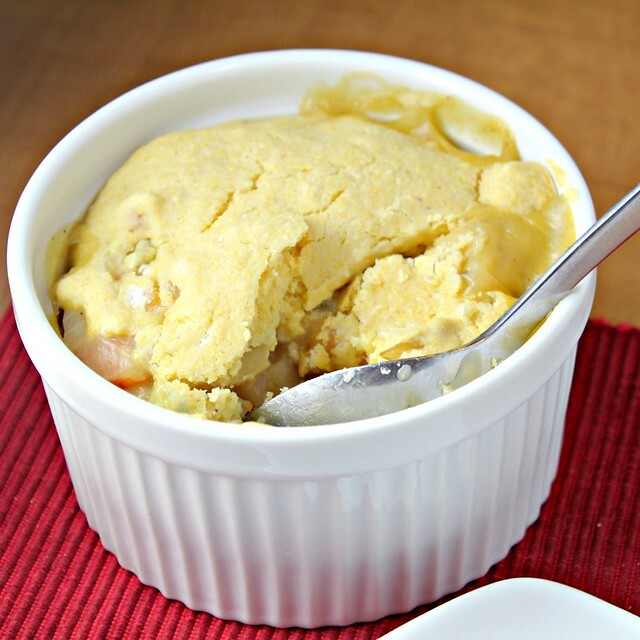 I have never tried the frozen potpies, as it is potpies are pretty exotic here… I am definitely tempted by these ones, being a chickpeas addict ! He said NO? Really? Well, his loss..I love guilty-free treat! I can’t believe he said no! I probably would have licked the ramekin clean if I got a hold of one. Veggie pot pies are on my list of things to make and I’m really intrigued by the corn bread crust. oh man, if that doesn’t spell out comfort, i don’t know what will. i love the veggie filled flavorfest on the inside, as well as that gorgeous crust. delicious! Oh god those frozen potpies. The worst. Well, I just wrote the most urbane, witty comment ever, and it got wiped out for some reason. So long story short… this is great, I will make this, you should be my new best girlfriend so we can talk about boys all the time and color together. I made a Mexican pot pie with a corn bread crust, but I like the traditional flavors here. And ugh, frozen dinners are soooo horrible! I’ll be honest, I have never been particularly moved by pot pie but I think your version just converted me. Love the inclusion of sweet potato and chick peas in this recipe. I would gladly eat your brother’s share! Love these way better than the chicken version! I used to eat the crusts off the frozen ones and leave the filling…I wouldn’t dream of doing that with yours. Your brother is like members of my family when it comes to eating dishes without meat. 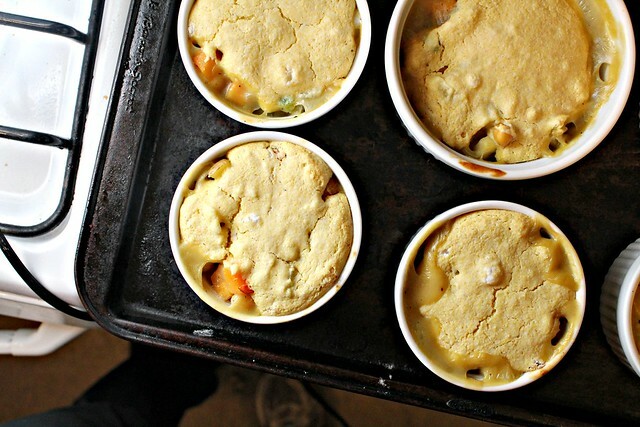 They usually take a pass, but they don’t know what they are missing out on.Veggie potpies are always my go to comfort food and these look so delicious! Thank you for sharing your recipe! I really like the change to a cornbread topping. Who knew?! I love how you think outside the box, Joanne. 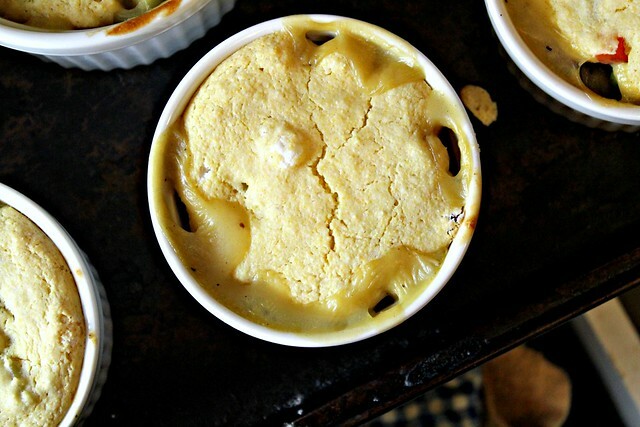 So many beautiful and delicous pot pies popping up in blogdom … making me hungry. I love the combination you have created, especially the cornmeal top. Mmm… that’s some serious comfort food. What a great twist on the classic pot pie. Very creative! I love any type of pie. The crust on these sounds really interesting and different too! That is a great idea. Kind of like a tamale pie topping. And WAY easier. LOVE the cornmeal crust. Mmmm. What a great idea with the chickpeas! Plus, I’m up for anything served in individual ramkins. Cute and tasty. I love pot pies A LOT. This sounds absolutely lovely! I am definitely a chickpea loving girl. If I didn’t know otherwise, I would swear there was chicken in your potpie! Looks delicious with a cornbread crust. Thanks for participating in WHB. A terrific idea using cornbread for the pastry top. Great WHB entry! I can’t even find the words to describe how good that looks! Hmmm… hubby loves the chicken pot pie… i might be able to use this… obviously he wont play without chicken, but a quick, easy and not enough sodium or calories to kill you – i’m likin it! Smooches! This looks super healthy. I think I might give this a try as my children love chickpeas.. Okay you are making my meal planning for next week really easy because I basically want to make all the things I’ve recently seen on your blog haha. My momma makes the hands-down best pot pie I have ever had – so good, in fact, that I am afraid to give it a try and end up disappointed! 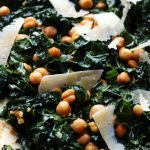 I am in love with the concept of this recipe though; not only do I very much love chickpeas (and a great alternative for my vegetarian cousin! ), but the crust would be so much less time consuming than my mother’s double pastry crust. I will have to give this a try for a quicker alternative to the old stand-by. I make a pot pie with turkey mince and kidney beans as a topping, but I’ll definiely be trying the cornmeal topping. Delicious recipe. I made this on Sunday night and we ate it and watched scary movies – it was our delayed Halloween night because we had to work on the 31st. Michael had (kid you not) FOUR PIECES. Needless to say… it was a hit… with the lights on and the fireplace going and Guillermo del Toro’s “The Orphanage” playing on the screen… it was a delicious night! What size of ramekins are you using? These look really yummy. Glad I found this! I’m a big fan of pot-pie but have not found a good veggie version. I can’t wait to try. Made this tonight. SOOOOOOOOOOO GOOD! It’s official, I have blogged about this amazing meal. Here is the link to it. Thank you! This looks really amazing!! I want to try it, but since my kids are allergic to eggs, is there anything you would suggest to replace the egg yolk with in the crust? I normally replace whole eggs with “flax-eggs” when baking, but since the recipe only calls for the yolk; I’m not sure how to replace it. Any suggestions? Thanks!! I think you could definitely just replace it with flax-eggs and not worry about it just being a yolk. Alternatively, you could use your favorite cornbread recipe as the topping or a boxed cornbread mix. I really think it will still turn out if you use a flax-egg! Good luck! LOVE IT Joanne! I actually enjoyed eating those frozen pies in the 60’s (at that time, a perfect consumer of convenience foods). 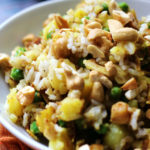 Now your healthful, homemade version suits my vegetarian palate. I actually crossed my fingers and doubled the recipe since it sounded so yummy. It came out GREAT…even for my kitchen skills, a not-so-adventurous, and infrequent from scratch cook!! Looks great, but what is AP flour? I have made this several times, but I like to use 1/2 cup dry white wine in place of some of the broth to give it a more complex flavor.